This page might take a minute or so to load and will scroll on its own when it's fully loaded. Roman crucifixion in Jesus' time. The cross is placed on the ground and the exhausted man is quickly thrown backwards with his shoulders against the wood. The legionnaire feels for the depression at the front of the wrist. He drives a heavy, square wrought-iron nail through the wrist deep into the wound. Quickly he moves to the other side and repeats the action, being careful not to pull the arms too tightly, but to allow some flex and movement. The cross is then lifted into place. The left foot is pressed backward against the right foot, and with both feet extended, toes down, a nail is driven through the arch of each, leaving the knees flexed. The victim is now crucified. As he slowly sags down with more weight on the nails in the wrists,excruciating fiery pain shoots along the fingers and up the arms to explode in the brain -- the nails in the wrists are putting pressure on the median nerves. As he pushes himself upward to avoid this stretching torment, he places the full weight on the nail through his feet. Again he feels the searing agony of the nail tearing through the nerves between the bones of his feet. As the arms fatigue, cramps sweep through his muscles, knotting them deep relentless, and throbbing pain. With these cramps comes the inability to pull himself upward to breathe. Air can be drawn into the lungs but not exhaled. He fights to raise himself in order to get even one small breath. Finally, carbon dioxide builds up in the lungs and in the blood stream, and the cramps partially subside. Spasmodically, he is able to push himself upward to exhale and bring in life-giving oxygen. Hours of limitless pain, cycles of twisting, joint-renting cramps, intermittent partial asphyxiation, searing pain as tissue is torn from his lacerated back as he moves up and down against rough timber. Then another agony begins: a deep, crushing pain deep in the chest as the pericardium slowly fills with serum and begins to compress the heart. It is now almost over. The loss of tissue fluids has reached a critical level. The compressed heart is struggling to pump heavy, thick, sluggish blood into the tissues. The tortured lungs are making frantic effort to gasp in small gulps of air. He can feel the chill of death creeping through his tissues. 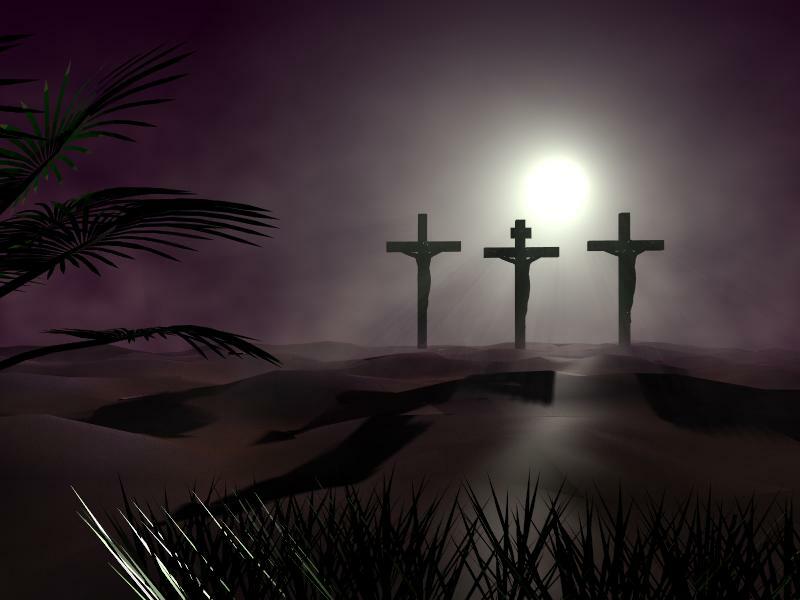 All this, the Bible records with the simple words, "and they crucified Him"
What wondrous love is this? And remember, this was only the physical pain. Imagine the spiritual agony of having known no sin of His own but voluntarily becoming every sin, whether large or small, that has ever been or ever will be committed. How it must have sickened Him and then hurt Him when God the Father, who cannot have any fellowship with sin, had to turn His face away!!! I marvel that He loved me enough to endure this, and I love Him for it! Amazing Grace! How sweet the sound! Now God does not see my sin when He looks at me! Fellowship with Him is permanently restored because He sees me clothed with the righteousness of Jesus, cleansed by His precious blood! How can anyone reject such a gift?